People who are new to this tradition might find the heading pretty weird, what is kalasam and what do jodanai mean. Kalasam is the symbolic representation of the God/Goddess for whom we perform the pooja. Every big pooja/function in Hindu tradition involves the use of Kalasam. The Kalasa/Kalasam/Purna-Kalasha is considered a symbol of abundance and "source of life" in the Vedas. The Kalasha is believed to contain amrita, the elixir of life, and thus is viewed as a symbol of abundance, wisdom, and immortality. It is believed to be a symbol of auspiciousness and thus worshiped in all Hindu festivities and functions from childbirth, marriage, house-warming, and many more festivities which cannot be included in one single post. As a Hindu, Navrathri and Varalakshmi pooja are two most important festival to me, for which i wait very eagerly. Reason is, i personally get to decorate this kalasam/Kalash. 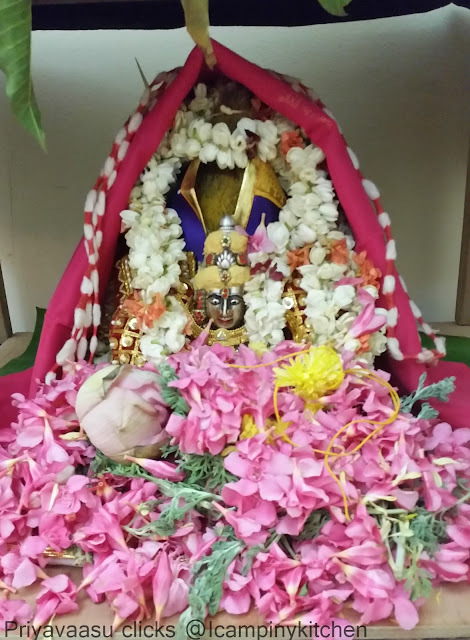 The Woman of the house-hold does the decoration/jodanai of the Kalasam. If it is a joint-family, elders in the family will take incharge and rest will take care of other preparations for the pooja. Now coming to the Decoration, every house-hold has different traditions and rituals when it comes to the jodanai/decoration, As a Tambrahm (Tamil Brahmin), i m listing the way i do. 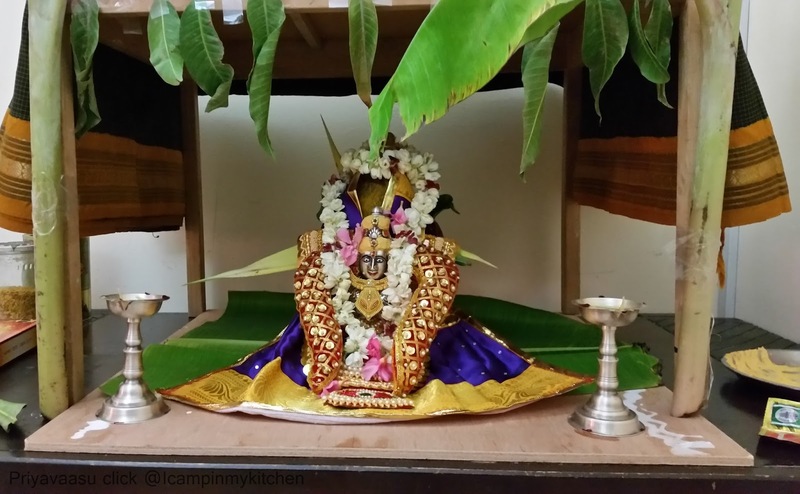 For us, the kalasam is important for both varalakshmi vratham and navarathi. 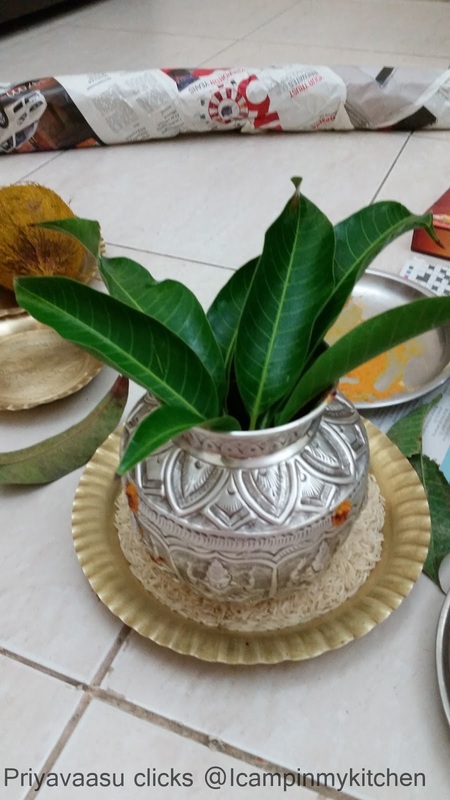 I do the same way for navarathi too,except for the mango leaves and the thazhampoo/Fragrant screw pine flower, which we don't use during navrathri, as they might dry out during the 9 day festivity. So, now let us begin. First Varalakshmi Vratham after marriage has to be initiated by your Mother-in-law or any elder in your family, after which you can do the pooja on your own from next year. . By initiation i mean, your Mugam/Goddess face will be kept along with your Mother-in-law's kalasam. Previous day to the pooja, wash, clean and wipe all the pooja vessels. 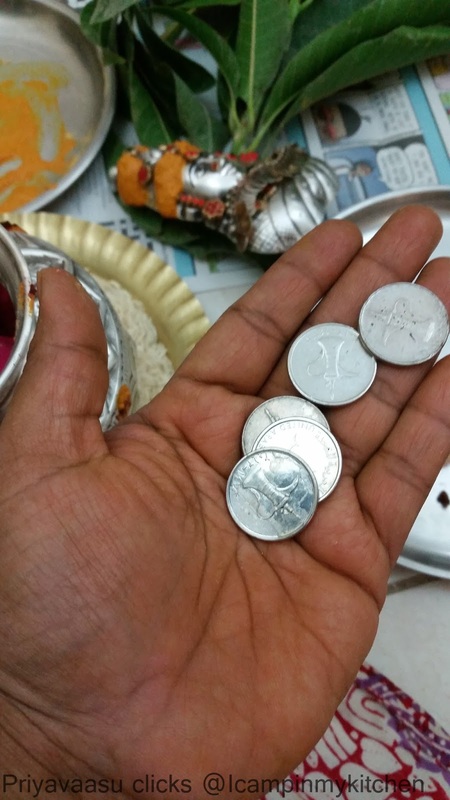 I use a silver pot for the kalasam, which is always kept neatly wrapped in a piece of cloth, along with the Mugam. So, it will be ready to use whenever taken out. But then, i wash it with little water and soap, and wipe it well to my satisfaction. Some, like my mom, till date use only Brass pot for the kalasam, it depends on their tradition. The Kalasam for the Varalakshmi pooja is decorated the previous night. It is usually done as the last job, finishing all house-hold work. First let us prepare the place where you are going to place the kalasam and do the pooja. Neatly sweep and mop the place. Do Ezhakolam/Kolam using rice flour/rangoli using wet rice flour. the corners of the pooja place are decorated with borders and the center where the kalasam is placed is decorated with a padi kolam. Do this a bit early, since it has to dry before placing the other decorations. We make a setup of mandapam/small temple like decoration. i used my coffee table and placed a plain wooden plank for doing kolams and used my kid's old study table as mandapam. The corners of the mandapam are adorned with Vazhaikannu/Baby Banana tree (hope the english translation is correct) and a thoranam of mango leaves,symbolising auspiciousness/Subham. Next the top of the mandapam ,is decorated with a silk cloth, i use my silk saree to cover it. Now the Temple setup is ready. Now let us start decorating the main kalasam. Both varalakshmi vratham and navarthi i use the Goddess mugam/Face in silver. These days, the mugam/face comes with all the decoration and jewelry,so needs very little touch-ups. The List of things to be put inside the kalasam, Keep them ready before starting the decoration. 5 dried dates/ i used normal dates, since i couldn't get any dried ones. The Silver pot is neatly wiped and decorated with Chandan/Sandalwood and vermilliion. Now the list given above is added one by one. First the rice, then dried dates, raisins, coins, betel leaves, vermillion and turmeric, lemon, and kaatholai karugamnai, which is very important. After all this, a bunch of mango leaves is inserted in the center along with fresh thazhampoo/fragrant screwpine flower then a coconut smeared with turmeric is placed at the mouth of the pot. Care to buy a good coconut that will sit nicely on the pot(size matters). Adjust the mango leaves and the screwpine flower to come neatly around the coconut , so it looks like a blossoming flower with the coconut as the center. 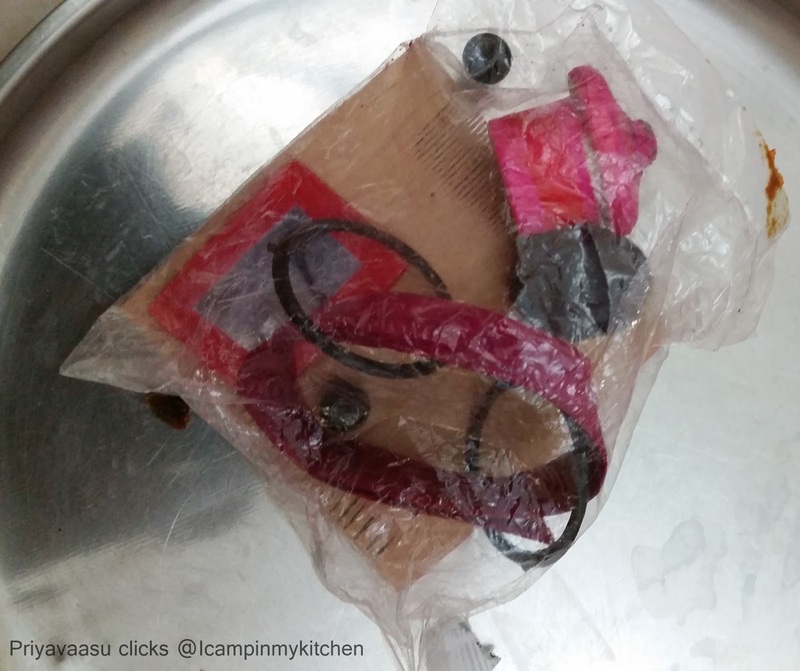 The pot is dressed up like a lady by tying a pavadai/skirt around its neck. These days we get ready-made skirts to be used on the kalasam at Giri Trading or every famous shop selling traditional pooja materials. The goddess face/mugam is inserted into the pot neck at the end of the coconut. Some even place the mugam at the kudumi/fibrous cone-shaped portion on the coconut. But according to our family traditions we do it at the neck of the kalasam. Next the kalasam is decorated with jewels and fresh flowers. I use a little kajal to add more beauty to the eyes. I also have a pair of thandu maalai with i put at each side of the mugam and a ready-made pearl jadai/hair decoration, which i placed at the back of the kalasam. Now the entire setup would look just like a lady, sitting before you. 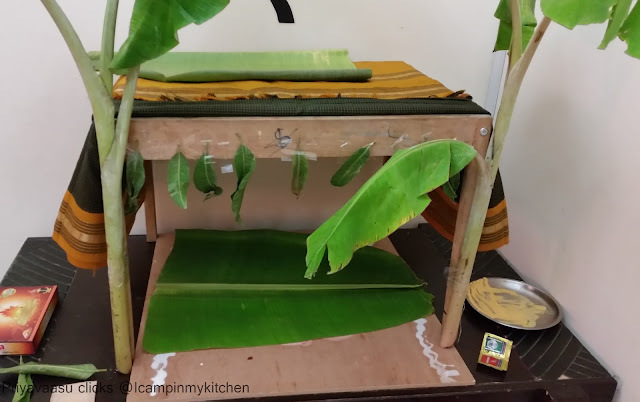 Place a plate full of rice on top of the mandapam which is decorated with a silk cloth, Carefully place the kalasam/ambal on it. Next day morning, the pooja can either be done before raghu kaalam or after raaghu kalam. I usually do after, since i cannot take the tension of doing both the pooja and the cooking simultaneously. Get ready with the Neivedhiyam first, which usually are Poorna kozhakattai, Raw-rice idly, Sundal, Rice and toor dal, Muparuppu vadai, sarkarai pongal or payasam. Before starting the pooja, keep all the pooja requirements ready by your side. Keep the flowers for archanai/pooja ready in a big plate/thambalam. Mani/pooja bell, thoobakaal/plate for camphor, camphor cubes, incense sticks, match stick, ghee/oil for the lamps. We normally Madisaar, while performing this pooja, a simple saree or a decent salwar kameez will also do. Place a big banana leaf inside the mandapam, where the kalasam would be placed with the pointed end facing left-side of the goddess. Place 2 cups of raw rice at the center and spread it as a circle, that is where you will be keeping the kalasam. Now, put kolam/rangoli at the entrance, where you will be welcoming the goddess. Place a manai/palagai/palaga/wooden plank with kolam, carefully place the kalasam on that plank. Light a small diya/deepam/lamp. Make a small ganapthy/vinaygar using turmeric and do the vinayagar pooja and a small neivedhiyam to ganapathy, a piece of jaggery/banana. After the thoopam and deepam. Carefully lift the goddess along with the palaka/plank and come inside the house,walk slowly and carefully place the goddess inside the mandapam on the banana leaf laid with rice. If you have a another lady or your own daughter you can help, ask them to hold the other end of the palaga and slowly walk together. since it was only me doing, i did all by myself. 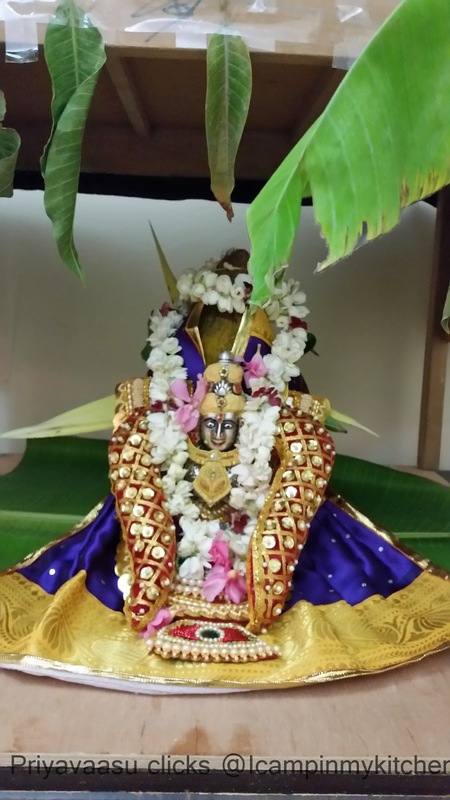 Always keep in mind it is a delicate kalasam, have bhaya and bhakthi together while entering with the kalasam. Light lamps near the mandapam, The Pooja details is generally given in Vratha Pooja Book, but then i m giving a general outline. First vinayagar pooja is done. Then we do Sankalpam, chanting the day, year, thithi and naksthara and seeking goddess blessing for the whole family. Next comes the kalasa pooja, where we invoke the almighty to come and adorn the kalasam and accept our pooja. Then Lakshmi Ashohram is chanted. After the Neivedhiyam/Offering, we perform pooja for the Sacred thread which will be worn on the right hand. 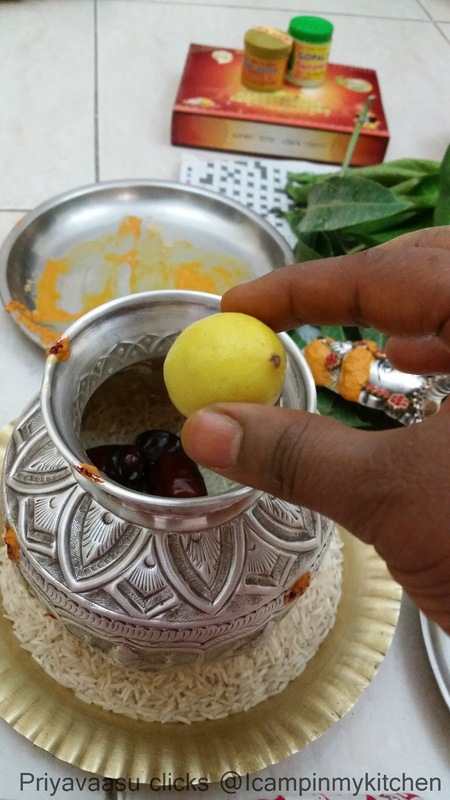 This is how i perform the varalakshmi vratham pooja. The kalasam is kept like that till next day morning. Next day again we do a simple pooja and neivedhiya/offering. In the evening, after the lighting lamps and a simple offering, we move the kalasam towards north symbolizing the end of the pooja and in the night before going to sleep the kalasam is kept inside the rice pot and next day morning, the decoration are removed, the rice is used for regular cooking and the coconut is used to make sweet/dessert and the lemon is juiced. so well explained Priya!!! love the clicks - so divine!! 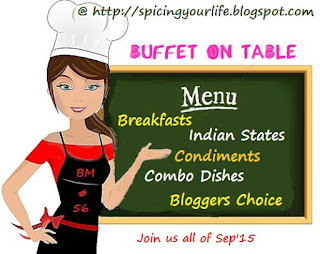 Such a beautiful post Priya!..thanks for sharing...though I don't preform varalakshmi vratham, I do have a virtual Navrathri pooja..this is wonderful documentation...and to think you almost said no for doing this BM!..see how wonderfully you managed to cook for all days..you should listen to elders ok..:)..
We don't do any poojas at home, but I love to see all these beautifully decorated pooja Thali , Kalash....I loved the Mandan you have created,it is so arty.., looks real cool, like a typical big mandap. The Kalash looks gorgeous and the idol that you have is absolutely stunning. A fantastic post. Such a detailed post and you explained it very well. Feel like visiting your place during this vratham, fantastic post and super detailed post Priya, again a fabulous write up. Very interesting to read about your traditions. We do the pooja in a different way. Nice to see the similarities and differences. Very nice reading about your tradition .We celebrate navratri but in different way.The kalash sthapana is almost same .Nice post. We don' do Kalasam for navratri, I think. And we do the Lakshmi pooja also differently, owing to regional diffrrences. I love your Lakshmi face, so beautifully decorated. Priya I love your post thoughI have never done these poojas I know my mom participated in them. What a lovely tradition beautifully written and explained. Very nice post. Pics also superb. Hi Priya, new to your blog. I have a question about the Amman mugam. I was given this for safekeeping by a friend when she was going through a divorce but have now lost contact with this friend. 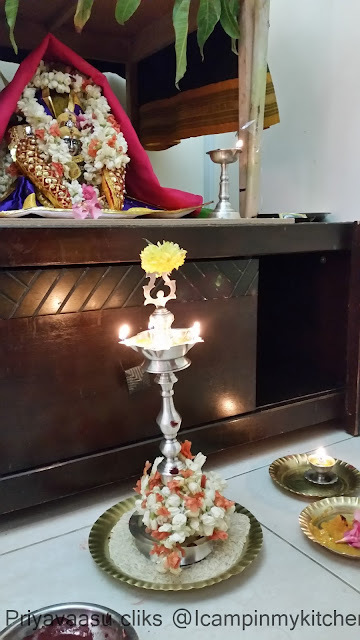 In my family we don't have the tradition of doing varalakshmi nombu but I have been advised by elders that I mustn't keep the Amman mugam at home. Please advise as to how I can proceed. Thank you. Hi jothsna, usually people who don't have varalakshmi poojai, never buy the mugam. If u ask me I don't see any wrong in having the mugam, but it should Be kept out the 3 Days of varalakshmi vratham, you can keep it in your pooja room and keep it back after the festival. But if you feel odd, since you don't have the practice, you can very well give it to a temple or any friend who has the tradition of nombhu. I will also try to check with my mom regarding this. Thanks for visiting my blog and for the question. Hi Priya, thanks so much for your reply. It answers my question. Thahnks!